Last Friday the boys were given a treat. 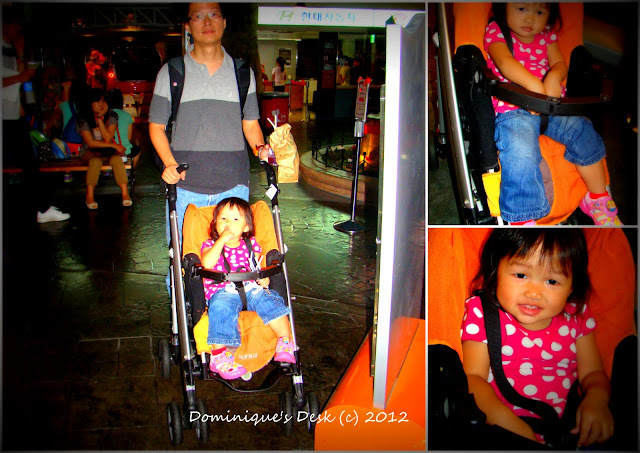 We brought them to Kidzania in Seoul. 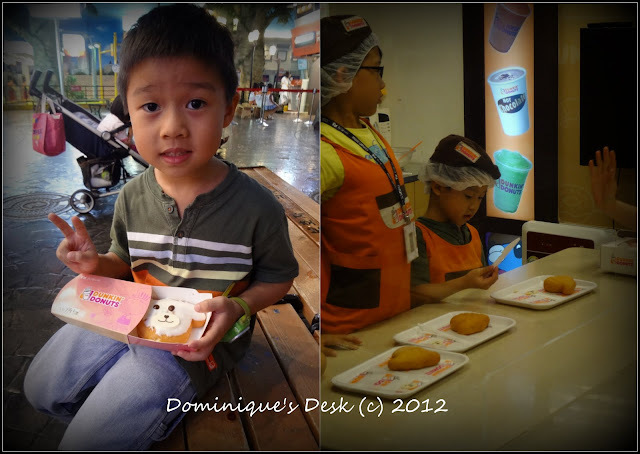 I have been hearing about this place from friends who went to the newly opened branch in KL, Malaysia and wanted to let the boys try it out. It works out cheaper to bring them to the branch in Korea then Malaysia after the various exchange rates. The only drawback was that everything was in Korean and the boys will not understand the instructions given to them as many of the instructors there would not be able to speak in English. 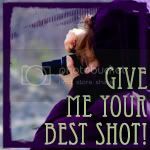 However I felt that language shouldn’t be much of a barrier for them as they could still follow by observing what the other kids were doing and go along with it. 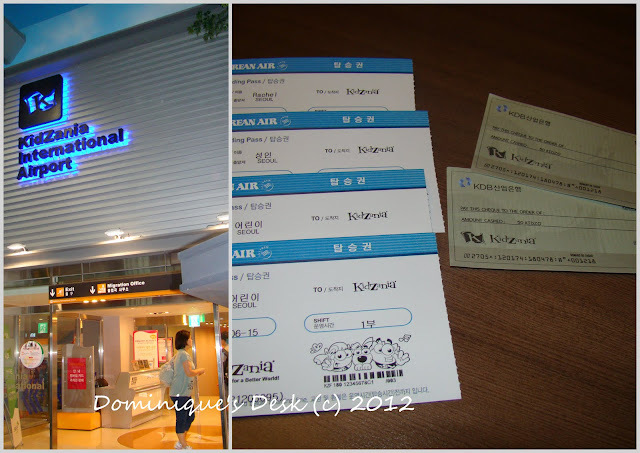 The entrance tickets were in the form of boarding passes for Korean Airline. They had to “check-in” like the way we check in when we board an aeroplane. The first occupation which the boys tried out- Aeroplane pilots. They had to wait about 1/2 hr before it was their turn to enter the cockpit. There were limited number of slots per session and this was one of the popular profession which the kids there wanted to try out. There was a steady queue for the sessions and the boys patiently waited for their turn at the waiting benches. We rented a stroller for Tiger girl so she could sit/sleep in while waiting for her brothers to try out the various professions. She was getting restless by midday so R took charge of the boys while I took her shopping. Monkey boy opted to work at Baskin Robbins. They were to mix and make their own ice-cream using the tools and ingredients given. He had fun making the ice-cream and more fun eating it. Monkey boy also tried out the process line at Dunkin Donuts. He decorated his own Donut to look like a teddy bear. It looks too cute to be eaten. The boys also tried out being Policemen for the day. 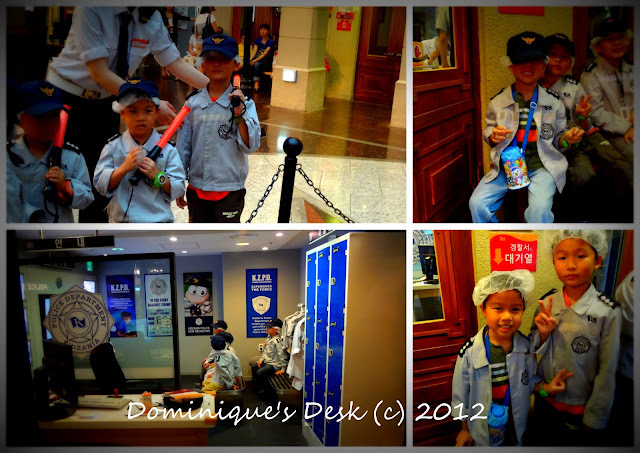 They were taken to the police station and given a briefing before being sent out on patrol of the streets at Kidzania. The boys also learned how to put out a fire and get to travel around in a fire engine. 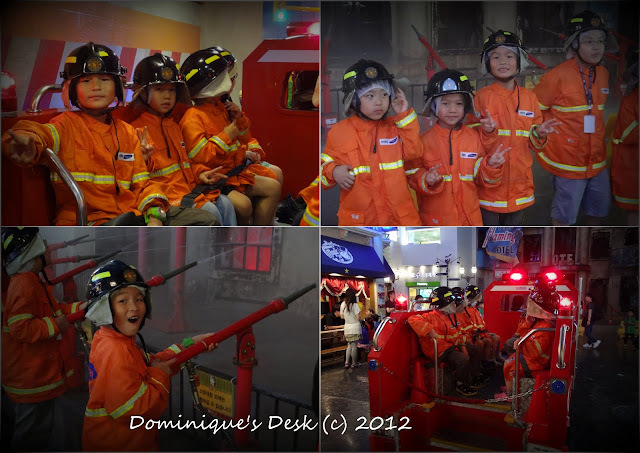 They really had a lot of fun last Friday and asked to go to Kidzania again if they have a chance. 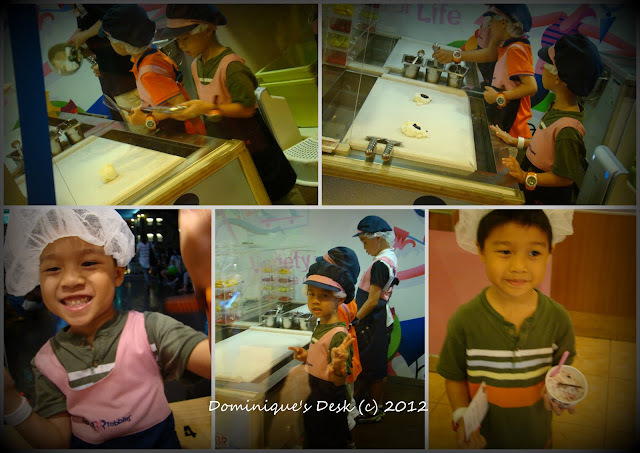 Kidzania will be built in Singapore in 2014 so it will be a long time before they can visit the place on home soil. We may take them to the branch in Japan next year if our holiday plans for Japan materialize next year. Do they have a place like this where you live? o my gosh that’s so much fun! Sesame Street–two rooms change every four months or so -last time it was Marval Heros and now its a design zone-learning about how roller costers, video games, music videos etc are made. I wish we had a place like that! But unfortunately there’s nothing like that around. Imagine making your own ice cream! We do have a park where kids can eat as many French fries as they want. That looks like such a cool place to take kids, I wish there was something like that near me! Visiting from VB! Wow! 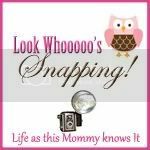 We have children’s museums that are fun, but they are nothing like that! My boys would LOVE a day there, trying out so many different jobs. Though we don’t have any current international travel plans, it’s definitely something to keep in mind for the future! Yummy! 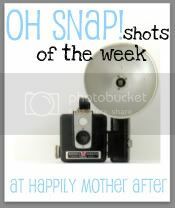 What a cool activities for kids..
That must have been so much fun for them! I don’t think we have anything like that here. Cool place!! 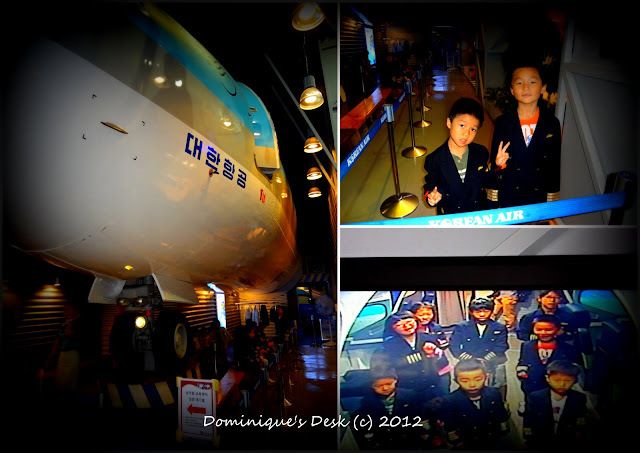 I will be visiting Seoul this nov & was contemplating if should bring my kids there. But after reading your blog, I’m more assured now, though there’s language barrier, the kids are still able to complete the tasks without much difficulty. 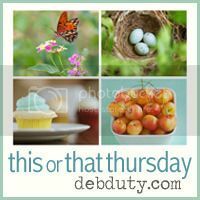 How old are your 2 boys? My kids are 4.5yrs & 6yrs, not sure if its too young for them? But I can see your 2 boys are having a great time! Do parents need to pay for admission or allowed to accompany the kids for free? Thanks!! my boys are 5 and 8 yrs old. I don’t think your kids are too young and should be able to enjoy most of the activities there. Yes parents need to pay for admission it is not free. Thanks for your reply! Much appreciated! !